If you are considering a new car, crossover, or truck, you should be careful not to buy a 2013 until you read this. Spring is the best time to shop for a new car. The winter and its host of hazards has come and gone. No more salt and sand to chop the paint and ding the windshield. As spring progresses the pot-holes get filled which means less risk of tire damage to your new car. And let’s face it, we like to drive when the weather is nice. Why not be in a new car now if you have ben thinking of buying? However, there is one bit of advice veteran car enthusiasts will tell you and that is to now get stuck with a car, crossover, or truck one model year older if you don’t have to. Skip the 2013s and buy a 2014 if you can. If you are shopping for a new car you will notice something odd. On the showroom floor of one dealership, say a Toyota dealership, you will see new 2013 model year RAV4s. That model is redesigned and just released. A few blocks away at the Mazda dealership is the RAV4’s arch rival, the Mazda CX-5. It is new in the past 13 months as well, but interestingly, the new CX-5s are model year 2014s. How can this be? This is the first reason to be aware of model years when shopping new. Since automakers can call their cars pretty much any year they like, it makes sense to consider the model year when buying. Why? Because when you go to sell the car on in a few years you will be advertising a vehicle one year newer to your used car buying audience. That is the first reason to skip the 2013 models this spring as you shop. A good friend of Torque News just bought a new 2013 BMW X3. The car cost well over $40K and it has navigation and a long list of innovative safety features. However, it did not come with a rear-view camera. Had this been a 2014 model that camera would have been included by law. Starting with model year 2014, all vehicles must have some kind of rear-vision assist per government mandate. The exact roll-out date has not been set, but in order to make things simple all 2014 vehicles will come with a back-up camera. Since every car has to have it, the price is not as high as you will find on a 2013 model year options list. This might save you about $200, and could save you from a back-up calamity. The conventional wisdom was that as cars progress and are released as new models the price inches up. Not true in all cases. 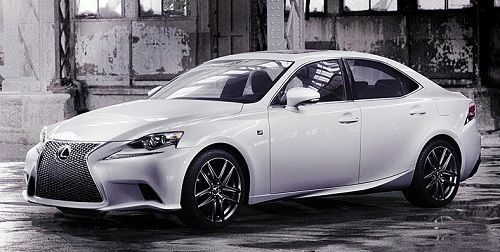 In fact, the new 2014 Lexus IS350 sports sedan is an excellent example. Lexus’ second most popular car, the IS250 and IS350 is at war with the BMW 3 Series. In order to lob a grenade over the ramparts Lexus made big changes to the vehicle, improving it in almost every way. Yet, the price has dropped between $2000 and $4000 depending upon options. Folks who just bought a 2013 hopefully got a great deal. Which leads us to one final point. Like all good rules this one has an exception. Simply put, if you find yourself at a dealership that has both 2013 and also the new 2014 models on the lot at the same time, you should try to drive a very hard bargain for the 2013- if that vehicle meets your needs. Sometimes the new and old models overlap and dealers are desperate to move the older ones off the lot. Make a low-ball bid for the older model and give the dealer three great reasons why they should let you walk away with a steal.